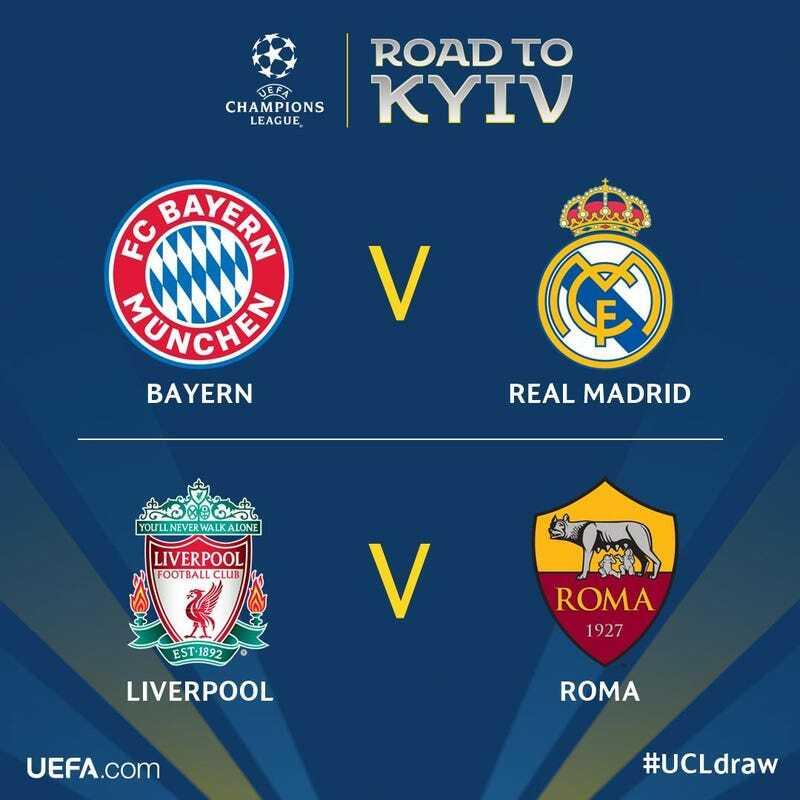 After a thrilling Champions League quarterfinal round that saw the threat of multiple enormous comebacks and one completed one, we now know who will play whom in the semifinal round for the right to compete for the European Cup in Kiev. The draw looks incredibly enticing. The biggest winners today are Liverpool. In the shock of the century, Real Madrid’s infamous luck somehow didn’t result in the Spanish side drawing what is by far the weakest team in the field: Roma. Instead, the Pool Boys are the ones who benefitted. The Liverpool-Roma tie is actually a more difficult matchup for Liverpool than it may seem at first, since Roma are the kind of team who will happily concede possession to Liverpool and force them to break down the Romans’ big and powerful midfield and defensive lines, which isn’t the kind of game Liverpool prefer. Still, Roma are significantly less talented than the other two potential competitors, so Liverpool fans should be ecstatic at the prospect of facing this opponent. The true heavyweight bout is the Bayern Munich-Real Madrid tie. These clubs have lots of history going at each other in European play over the past few years, and Bayern will be itching to avenge some of their high-profile losses to the Spaniards of late. Real seem fated to win this competition for the third time in a row. As long as they are focused and at their best, they should have enough in their amazing squad and in the legs of their ageless superstar, Cristiano Ronaldo, to get past Bayern. Neither of these teams are as good as they have been in years’ past, but they both still have multiple great players capable of deciding games on their own. All this talent and coaching acumen and experience on hand should make for a great couple games. Here’s hoping Bayern can do all us proponents of justice and righteousness a favor by defeating the forces of iniquity and evil. Arsenal vs. Atlético Madrid, aka the “Will Arsène Wenger lose here, consigning the Gunners to yet another embarrassing season in Europa League play, and consequently get himself fired finally, or will he pull off the upset en route to winning the tournament and by doing so save his job?” matchup. Atlético are better than Arsenal, but not wildly so, which means Arsenal do have a good shot at pulling off the upset. It must be hard, though, for Gooners to know how to feel: do they root for their team to get past Atleti and win this title to see Wenger stay on for what portends to be yet another season of mediocrity, or do they hope to lose here in hopes it forces Wenger out and starts the much needed rebuilding process at long last? Either way, it will be fascinating to see what ol’ Arsène can do with his back up against the wall.